Those parts include Trump’s plan to build a wall along the nation’s southern border, expected to cost somewhere between $15 and $20 billion. Taxpayers will pay for that wall according to the president’s executive order, with reimbursement to come from unknown sources at some unknown future date. There’s the president’s $1 trillion plan to upgrade the nation’s infrastructure (highways, bridges, tunnels, etc.). And he wants to increase the Pentagon’s budget substantially to make the nation’s military power “awesome.” Finally, he wants to do this not by raising taxes, but by cutting them instead. 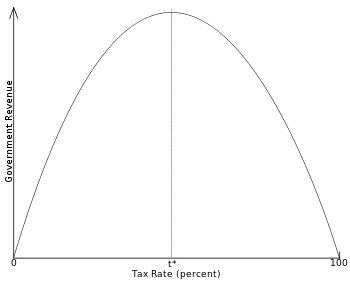 Enter the Laffer Curve. Without using the term, Mnuchin expressed the belief system almost perfectly. Ascribed to Arthur Laffer in 1974, the Laffer Curce predicts that at some tax rate, likely lower than it is at present, government revenues will increase rather than decrease. That prediction had better work in light of the budgetary wishes and constraints the Trump administration has already put in place. The United States’ economy is the largest in the world, pumping out nearly 25 percent of the globe’s $74 trillion in goods and services and employing 152 million in the process. Surely, in there, somewhere, is enough revenue to pay for all of the Trump administration’s plans without increasing the nation’s debt. For fiscal year 2017, adopted under the Obama administration, healthcare takes up 22 percent of the government’s nearly $4 trillion budget, while Social Security and other pension and retirement programs soak up 19 percent. Federal education programs take up 15 percent, with military spending absorbing 12 percent. Welfare programs take another seven percent, while interest on the national debt hovers at six percent. That’s 81 percent. The remaining 19 percent consists of transportation, operating the government, and “other” spending. If Social Security and Medicare are taken off the table for cutting, the military budget is expanded, corporate and individual tax rates are reduced substantially, and interest rates stay the same for the foreseeable future, where else will the necessary cuts be levied to keep the annual deficit ($587 billion in 2016) from growing? Trump, Mnuchin, and the head of the White House Office and Management and Budget (OMB), Mick Mulvaney, had better hope that cuts in executive agency operations, reductions in regulations, eliminating ObamaCare and its drag on the economy, and Mr. Laffer’s curve all perform as advertised. Don’t expect to read anything in Trump’s budget about his faith in the Laffer Curve. Expect instead to read something about “dynamic scoring,” the magic of modelling future results from those various changes in incentives, assuming they are passed by both the House and the Senate. Economists hedge their bets when talking about “dynamic scoring”: Due to the complexity of modeling economic behaviors, applying dynamic scoring to a policy change “can be difficult.” Forecasters “must infer” from current behavior just how those changes will impact the future. This entry was posted	on Tuesday, February 28th, 2017 at 6:55 am	and is filed under Economics, Politics. You can follow any responses to this entry through the RSS 2.0 feed. You can leave a response, or trackback from your own site.